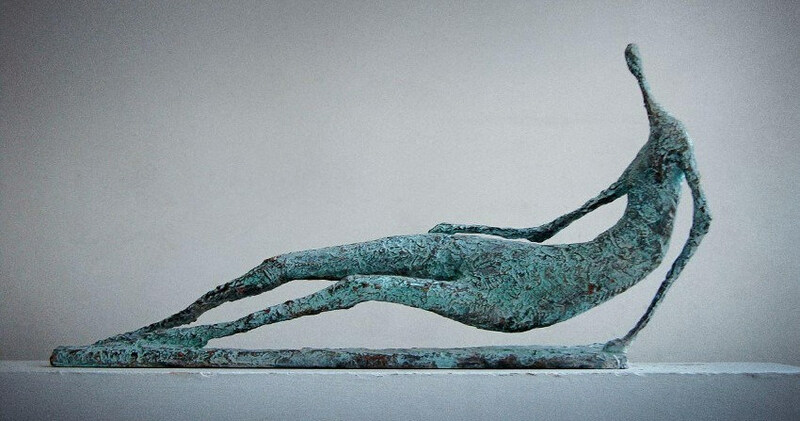 For more than thirty years, Pierre Yermia has been developing his sculptural practice, confronting strength and fragility, constantly striving to reach and capture moments of precarious and unlikely balance. Filled with human and animal characters, his body of work represents endangered but optimistic and unfazed humanity. The artist tries to simplify the line without making it poorer, always giving it energy, drive, and then an indefinable breath. Everything in his sculpture must appear obvious, and for that, he works a great deal. However, the finished sculpture must never reveal the effort. He studied at the School of Fines Arts in Toulouse, where he was introduced to sculpture by an extraordinary teacher who became a great friend, Aroldo Zavaroni. Later he continued his studies at the School of Fines Arts in Paris, where he spent four years, from 1984 to 1988. Several traits are clearly visible throughout his work – reduced to bare essentials, the figures’ head dominate long and slender necks, contrasting the elongated shapes with the massive torsos. A never-ending game between full and empty, convex and concave, heavy and light, shapes Yermia’s figures. Placed on frail limbs, his animal and human sculptures defy the laws of gravity. 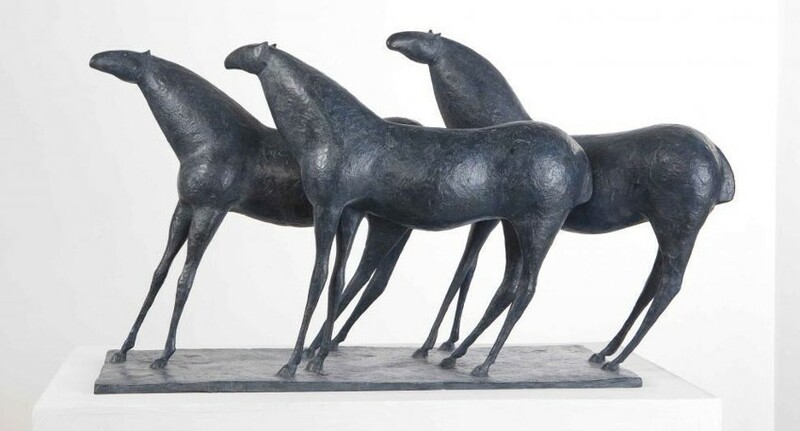 Sometimes ending with monumental sized pieces executed in bronze, medium and small size formats in the preceding stages are a necessity for the sculptor. 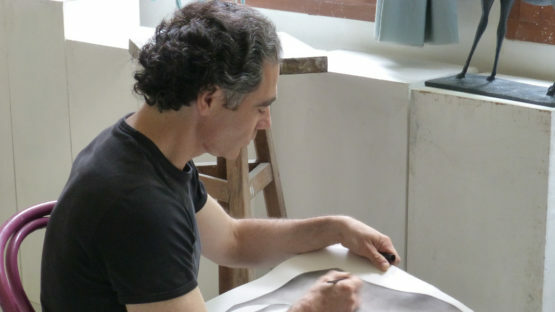 Since it gives Yermia a vision of the piece, the artist works a lot on the drawing, in which he already sees the connection of the shape with its space. Upon having a vision, the sculptor makes a very detailed graphic work, making the quality of drawing is essential to the process. Once a framework is conceived, he welds the structure, thus giving his piece a skeleton. Working primarily with plaster, it’s a material that looks rather austere, but has great qualities and makes all the elements of the piece visible – all the good parts, and all the faults. The light on the plaster is radical, and the artist can see the work absolutely bare, just as it is. Re-working the piece comes next, using files and saws, in order to give it the tensions of the shape. Constantly working, Yermia adds and removes, seeking a dimension of strength that comes from a density of the volumes, trying to always make it visible in plaster. In the end, each and every sculpture is an expression of a rush, a pure moment of grace and balance, in which the viewers feel both the frailty of mankind but also its force. Pierre Yermia’ work is critically acclaimed, and he’s won a number of awards, but several stand out: in 1990, he won the Sculpture award, Lauriers Wiso; Vermeille medal with honours of the Lutèce Internationale Academy in 1991; City of Ernée award in 2000; City of Charanton Lion’s Club award in 2011; and the most recent one, in 2016, the City of Charenton’s award. In addition, his works have been regularly exhibited throughout France, but also in the United Kingdom and the United States of America. He is represented by Artistics, an online art gallery. Pierre Yermia lives and works in Charenton-le-pont, France.